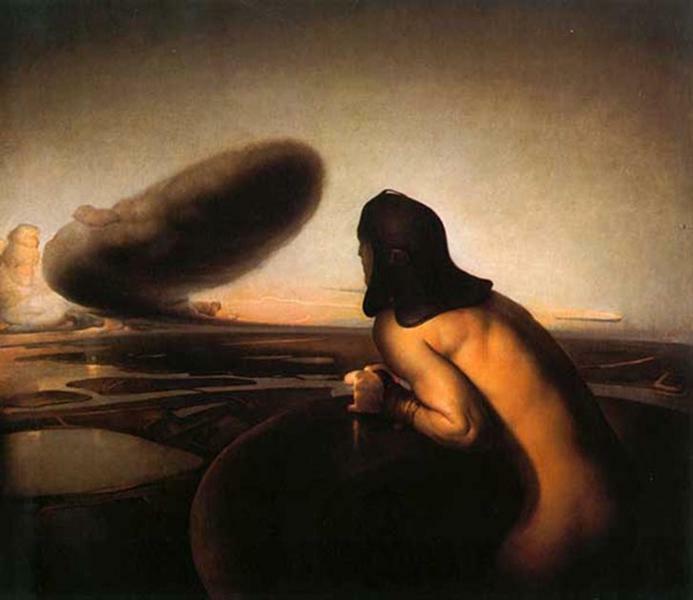 Lunatics (2001-2002) by Odd Nerdrum is an enigmatic scene with an apocalyptic atmosphere: it could be an ancient civilization or a society from the distant future. 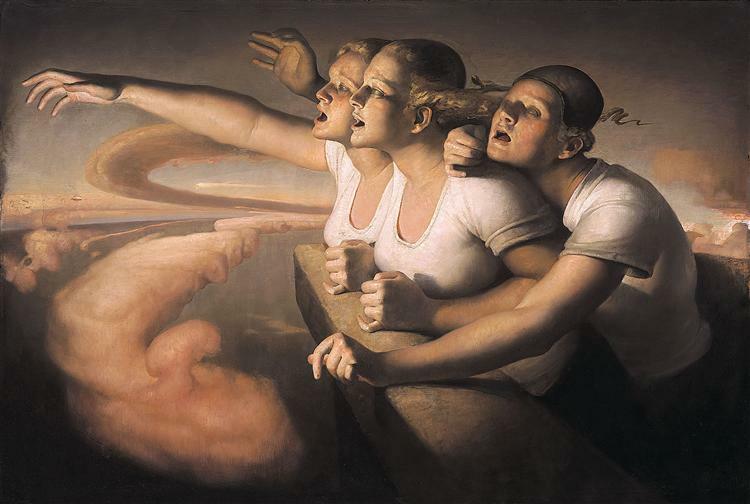 Lunatics should be understood in the context of Nerdrum’s body of work, as it built upon ideas the artist explored in earlier paintings. 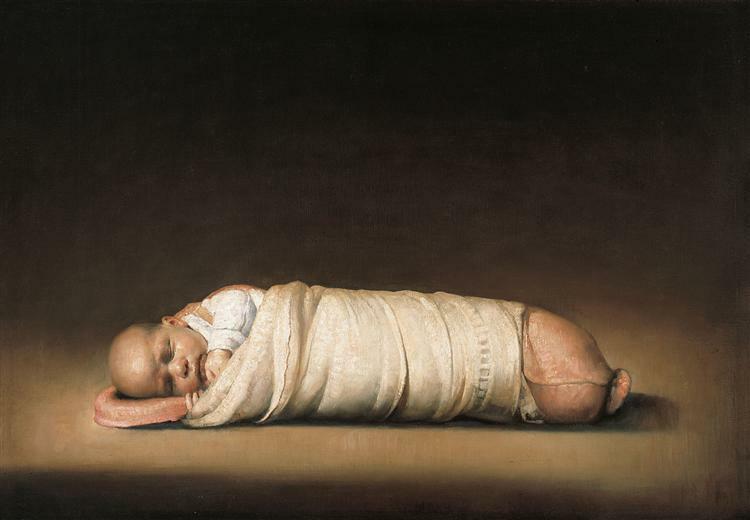 In the early phases of his career, Nerdrum focused on contemporary subjects and everyday reality. 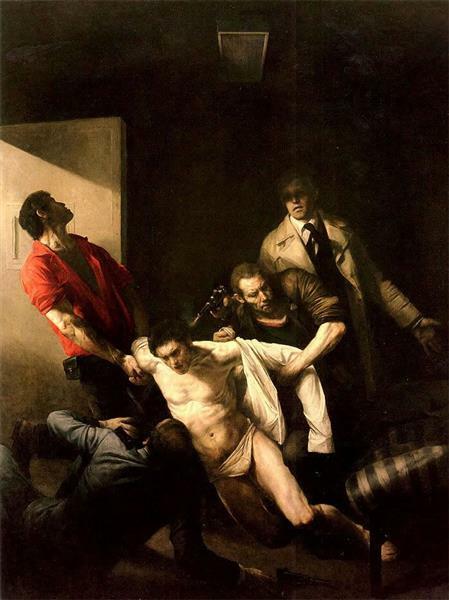 However, by the early 1980s his subject matter drastically changed. 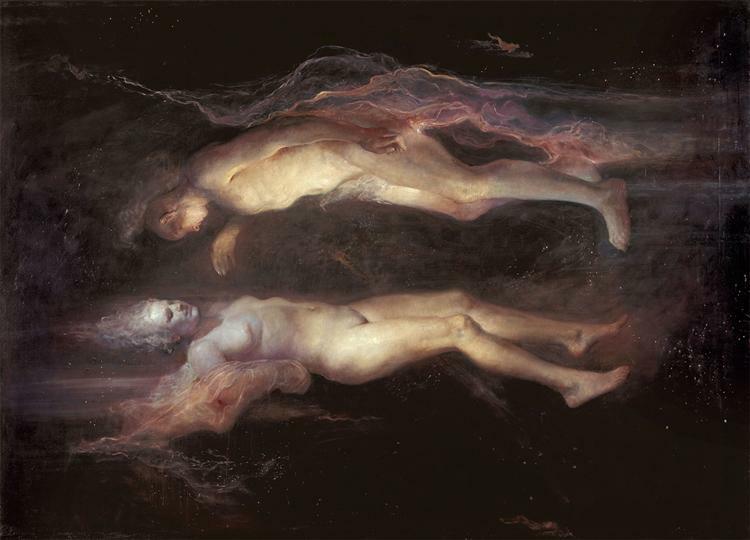 The artist began constructing a new world which described a primordial and archetypal existence. In the beginning his paintings, such as The Ultimate Sight (1985) and Return of the Sun (1986-1995) depicted some type of ritualistic activity, and later paintings like Pregnant Women with Followers (1999) and Sleeping Prophet (2000) showed a group led by a prophet figure. Lunatics is situated in a similar kind of reality. 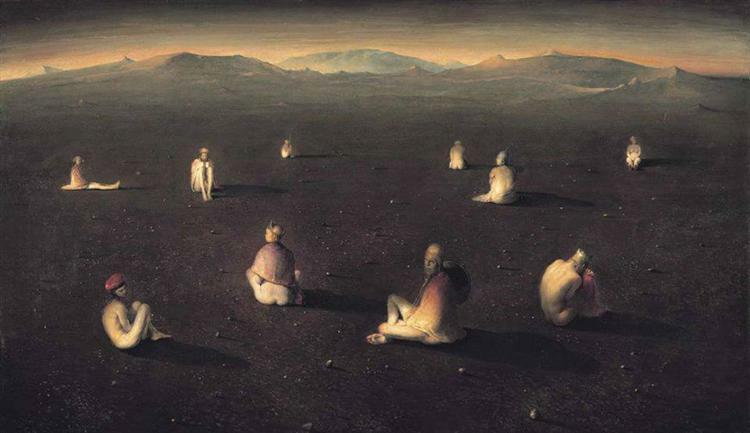 Ten figures are scattered in a barren landscape wearing strange garbs: cloaks, armor, fancy headdresses and helmets. However, unlike the aforementioned paintings, there is no clear leader or purposeful activity taking place. The group in Lunatics is in a state of repose: they are all waiting, but each figure is on its own, isolated from the other individuals in the vast space. This state of alienation is also seen in Dawn (1990), where four identical figures are turned sideways with their mouths gaping. The sense of isolation in Dawn is expressed through the mute screams, but no such aggressiveness is apparent in Lunatics. In contrast to the tight composition of Dawn, Lunatics has a tremendous sense of space and depth, of the never-ending landscape. It also has a rich color palette of deep violets, and scarlets, and tones of blue, that harmoniously play against shades of ochre and gold. The scenery in Lunatics is consistent with the desolate environment shown in Dawn and other paintings. 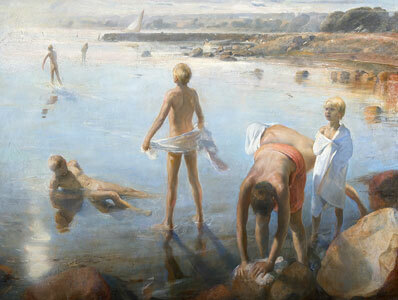 This type of landscape, also seen in Dawn, was likely based on the Nerdrum’s extensive studies of the Icelandic landscape. This barren environment, scarce in resources, is often a backdrop for scenes of violence like in Iron Law (1983-1984) and Woman Killing Injured Man (1994). 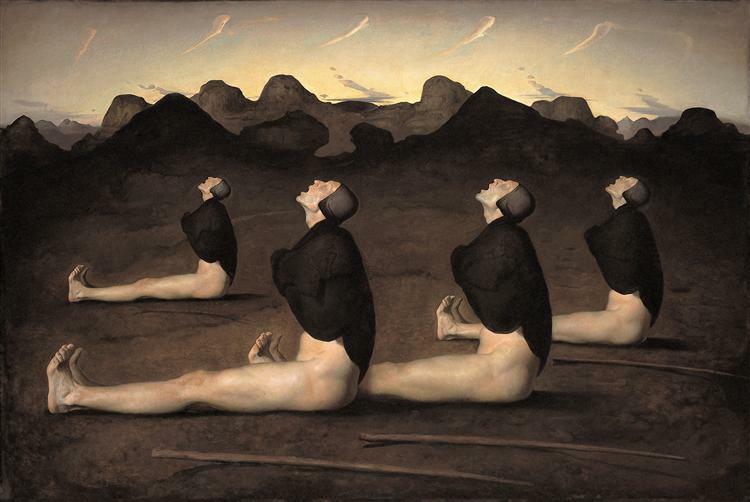 In Lunatics Nerdrum evolves to another phase. Although there is a sense of alienation in Lunatics, there is also a feeling of togetherness, or at least a desire for community and family. According to scholar Matthew Ballou, the group in Lunatics is in a meditative state. Their silence can be interpreted as spiritual or ritual, like a congregation in the Eucharist. 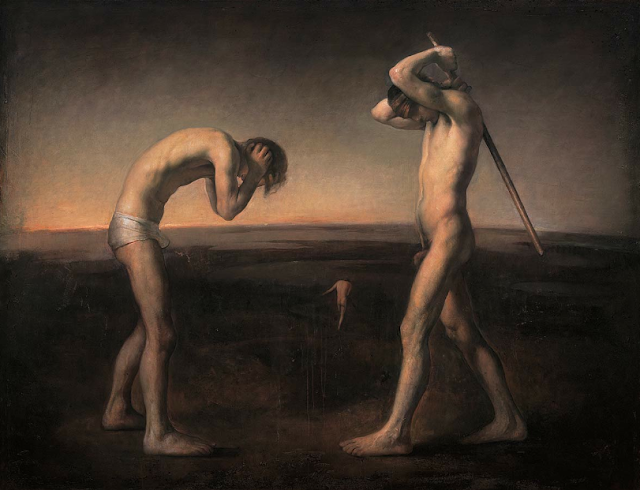 Nerdrum’s paintings aim to tell the essential nature of human experiences. 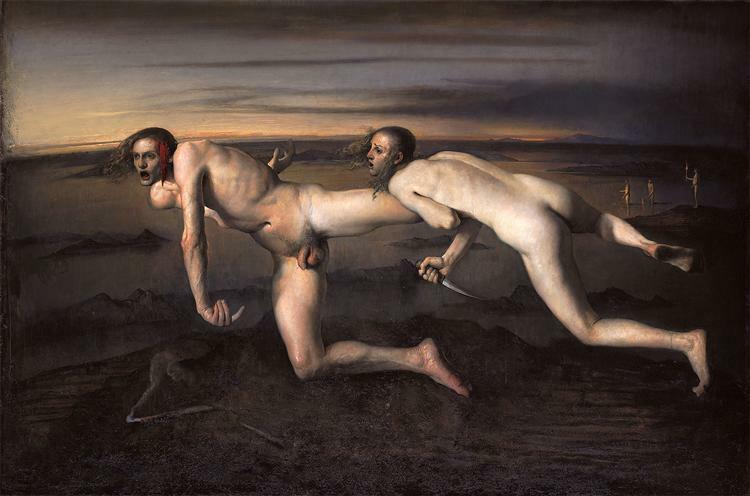 The first stages of community and the human desire for unity depicted in Lunatics is more explicit in Nerdrum’s works like Flock (2006) and Wanderers by the Sea (2000). Lunatics captures the experience of isolation, but at the same time hints at the basic human desire to create community and eventually society.